Inhaling was exactly what Edwin C. Kirkwood ordered. 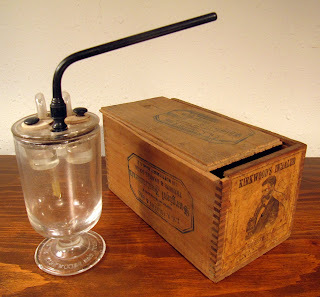 While there were many different inhaling devices on the market in the 1870s for the treatment of catarrh, asthma, cough, and disease of the throat, lungs and nasal passages, Kirkwood's unit had the look of a portable scientific laboratory. A clear, thick glass goblet was to be filled half way with water while a second smaller interior receptacle held muriatic acid and a third held ammonia. The fumes of the two chemicals were drawn into the water by the siphoning pressure of inhaling. The resulting mixture of the ammonium chloride fumes were sucked by the sufferer of throat, sinus, or lung problems through a long gutta percha tube that was connected to the goblet through its lid. Then, like Taurus the bull and smokers of Dr. Perrin's cigarettes, exhale through the nose: "If the inhalations are for diseases of the nasal passages, the fumes should be ejected through the nostrils by closing the mouth." The illustration on the product advertising shows a well-dressed gentleman demonstrating the decorous medical snort. The instruction manual also advised when to use the inhaler, which was almost anytime and at lest four times a day (like many of our medicines today, once every four hours): "Inhalations should always be taken before retiring, immediately after rising, and midway between meals, but never immediately after eating." Kirkwood was the clerk of the U.S. Naval Bureau of Medicine and Surgery and with his great connections there was able to garner a lot of well-placed endorsements that included the Ex-Surgeon General, the Medical Inspector-General of Hospitals and Fleets, hospital directors, surgeons, and doctors, but easily the most notable testimonial was for and in behalf of King David Kalakaua of the Sandwich Islands. He had become king of that archipelago, later known as the Hawaiian Islands, in February 1874 and in November of that year he traveled to Washington, D.C. to visit U.S. President Ulysses S. Grant. 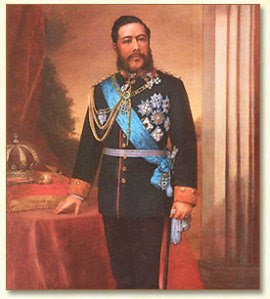 He became afflicted with a cough and acute bronchial trouble during his visit, so Dr. T. J. Turner, Medical Inspector with the U.S. Navy, got the ailing King Kalakaua to use Kirkwood's Inhaler "with the most successful result," and the relieved monarch took another of the inhalers back with him to his home among the Sandwiches. Hope he didn't use it immediately after eating. Postscript: King Kalakaua died in 1891 of kidney disease, probably caused by diabetes - but his lungs and throat were fine. 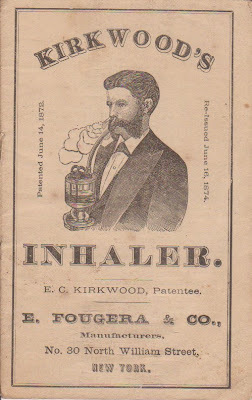 Post Postscript: In doing research for this blog post, I came across another wonderful website with great images and information about medical inhalers from the 19th and other centuries. It is called Inhalatorium; I have added it to my sidebar, "More Fascinating Quackery"; it's well worth the visit.